Listed in Ikeda Bunko, Kamigata yakusha-e shūsei Collected Kamigata Actor Prints, vol. 1, Osaka, 1998, no. 364. There is one other print from this series of 9 in the Lyon Collection. 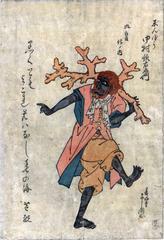 It represents Nakamura Utaemon III as the Tamamo no Mae. There is another print from this series in Lyon Collection. See the link above.